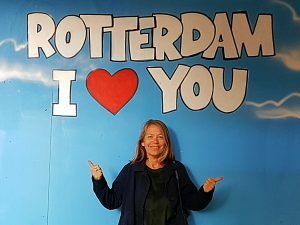 The perfect tour – guide in Rotterdam, if you like a personal inside into the city and ‘go where the locals like to go’. It’s a long time, 8 years being a proud Rotterdam author on SpottedByLocals. I have seen the city changed, since I am writing about spots I love in this fantastic place that I call home. Some shopping: Plek, Margreet Olthshoorn, Collectiv. by Swan, Keet, Fleur, Saks 5th Off, Nw Binnenweg ..
Gallery Crawl: Wilfried Lentz & Tale of a Tube, Brutus, Joey Ramone, Taal, Herenplaats, Printroom, Rianne Groen, Roodkapje, Cokkie Snoei, Zerp, Phoebus, De Aanschouw, TENT., v/h Witte de With, showroom Mama, Vivid, Wall gallery, Bob Smit, GROOS, Upominke, & Garage Rotterdam. We have no historical heart, it was bombed away. We are rebuilding the city, what makes it exciting to live Rotterdam. We love the old and the new, but wish the rough edges are treasured a little better as we’re wiping the life out of it. World famous university, harbor and events International Film Festival, North Sea Jazz Festival .. . Hiphop and Dance scene. Great and little shops, restaurants and bars. To many to choose from. Typical for the people here is that we make things happen, so leave your ego at home. All you need to know is where to go, all the great is spread across town. Fire Boundary Walks a coined periphery of the city bombardment – marked with special lights in the ground. Route A – West gives an interesting mix of historical and post-war architecture. Ask for the free map at Rotterdam Info – Coolsingel 114! Check the Rotterdam Experience in the basement, get yourself a picture and you’re ready to get lost. The vibe of a city accommodating more than 174 nationalities is best to be met at the Afrikaandermarket or West Kruiskade, starting in China Town with Amazing Oriental (in old Nighttown), Wah Nam Hong, Slagerij Schell, Me Gorgeous, Suri Change. Breakfast at Nixy & Lexy (34B). Meet the Giant of Rotterdam and don’t miss the side streets with gem’s like Cinnnamon, Sugar Coated, Kampong Express ..
You could head all the way up to Mathenesserplein and continue your journey Discovering the West. Tour UNESCO heritage Van Nelle Fabriek or go during Art Rotterdam or Swan Design Market, Justus van Effenblock with Wilfred Lentz and Tale of a Tub galleries located in the heart of this complex. Madein4Haven, where a fair gentrification process is slowly changing this old harbor area squeezed between Vierhavenstraat with Dakpark [watertaxistop Keilehaven #81], Marconistraat with Fruitvis & Uit je Eigen Stad and river Maas [watertaxi stop Europoint #87]. World famous designers Richard Hutten, Daan Roosegaarde and artist Joep van Lieshout have studios in this area. Worth visiting BRUTUS, the new exhibition space of AVL Mundo at Keileweg 12-14 [Thu – Sun 13hrs-17hrs]. In Coolhaven – tea or coffee at Evermore and De Machinist. For a historical feel, Old Delfshaven – drink a beer at brewery Pelgrim or get a bite at Ap Halen. Jugenstil around Veerhaven, Art Nouveau in Kralingen’s Wagnerhof. Great architecture around Weena, Maritime District and Kop van Zuid, a valhalla for architecture lovers and more to explore Wilhelminapier, Dobberend Bos, Photomuseum, Nhow, Lantaren Venster, Rijnhavenbrug also interesting Piet Oudolf, Loods 24, Poortgebouw, Peperclip, Rotterdamse Munt. Head to Katendrecht for Fenix Food Factory, Fenix House, Pinball Museum, around Deliplein : Ouwe Hoer, Matroos & Meisje, Du Bac, Kopi Soesoe, Verhalenhuis (always a warm welcome to Kaapse history and stories) and watch a sunset at SS Rotterdam deck. NEW! thanks to locals – a shortcut from SS Rotterdam to head of Charlois with free ferryboat [Mon – Fri 7:00 – 10:00 and 14:30 – 18:30 pedestrians and bikes only]. You got to love CS-area and Central Station with cosy Huiskamer that we all use to meet or wait. Architect Huig Maaskant’s post-war architecture Groot Handelsgebouw with hip rooftopped Suicide Club & cool Altijd in de Buurt. Nice contrast with the modern and post-war architecture is taking the North exit of Central Station to Proveniersstraat. It leads to a beautiful canal, great coffee and good food. Also shortcut to second part of Hofbogen and into North. Relaxing at Kralingseplas, in Vroesenpark – AD’s Gouden Pollepel 2017 price winner Vroesenpaviljoen and The Park – Parqiet, at Trompenburg, day dream at Aloha, follow the river and walk the bridges, enjoy Piet Oudolfs gardens between Leuvehoofd to Westerkade, floating Leuvetrappen – a perfect down town picnic spot or for dipping your toes in the river Maas. Chill at Biergarten / Annabel & BAR. Walk the Luchtsingel to Hofplein Station and Hofbogen. Explore the North by following the Hofbogen with Bird, Eurotrash United, new small market hall Marché 010, Hoofdkantoor and Coppi Coffee & Bicycles. Scrap XL. Vegan Gare du Nord. New development at Noordsingel Tuin van Noord, shopping in North at Zwaanshals, Zaagmolenkade and Noordboulevard. Perfect lunch and sweets at Lof der Zoetheid. Shopping in West at Nieuwe Binnenweg: Plek, Voorlopig, Zigt .. Perfect bag by Susan Bijl at Westersingel. At Witte de Withstraat Collectiv. by Swan, Margreet Olthshoorn, Sluijter & Meijer and with X-mas at Dirckx. Aert van Nestraat & Oldenbarneveldstraat & Oude Binnenweg. Downtown shopping Lijnbaan, but I limit myself to Donner & Bijenkorf through the Koopgoot to Hudson Bay and Hema. Might continue my route to Meent-area Hay & Keet or continue on Hoogstraat heading to Laurens District for Pannekoekstraat, Botersloot en Nieuwemarkt for the hip and happening and Hoog District for GROOS and all the way down at Hoogstraat to Charlotte Wooning. Follow the art International Sculpture Collection, ArtIndexRotterdam & Kunstblock, Rotte-Dam, Rewriters Streetartroute, Interactive Streetart, De Aanschouw, TENT., Boymans van Beuningen, Het Nieuwe Instituut, Kunsthal Rotterdam. Take a stroll along Westersingel though Museumpark and crash at Parqiet in The Park. Enjoy Rotterdam!, feel free to let me know what you think of my shares. If you like a personal inside tour and ‘go there where the locals like to go’, just book a private How to be a Rotterdammert™ tour – highlights in 2 or 4 hours. Great for expats, if you want to see your city through my eyes, impress your guests or just if you have to little time to find your own way. As said, all the great is spread across town, so having me as your guide is not only a smart but also fun move.